Stylish, modern, warm, cosy, apartment sleeping 5-7 in the beating heart of Madrid. Fully refurbished by designers, Fibre Optic + Chromecast +WiFi Dongle (for connectivity around town) + free local phone, quiet, luminous, to visit, hang around, eat in – or out. Perfect location to explore Madrid in all its facets. 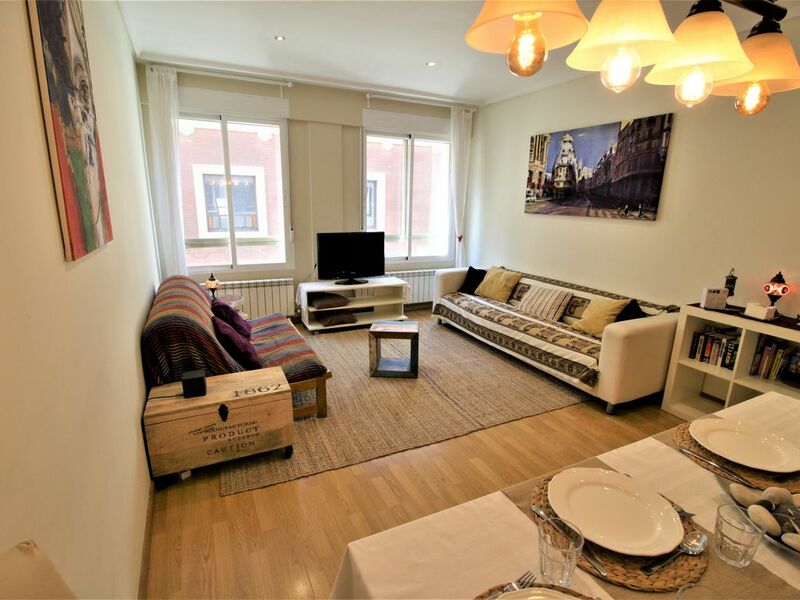 Situated right in the centre of Madrid, this quaint 2-bedroom apartment sleeps up to 7 (1 king size, 3 single beds, 1 sofa-bed) with a bright sitting room, kitchen space and patio. A wonderful choice for anyone looking to explore Madrid for a few days. Tech is a feature of the apartment. The apartment is fitted out with Fibre Optic internet, a Chromecast for internetTV, a fixed telephone for FREE local calls, as well as a portable dongle to which 15 devices can connect for connectivity outside of the apartment around town. The two bedrooms consist of three single beds in the one room and master bedroom with King Size bed and Memory Foam mattress. When it comes to the sleeping experience we’re hoping you sleep even better than you do at home! This is an apartment that has been renovated and refurnished to the highest standards: long sofa, wooden futon/ sofa bed, ivory-painted walls and chrome light switches. The sitting room is large, luminous and externally-facing – meaning more light – but as it gives on to a side street, there is almost no noise. Spacious, elegant, and unbeatably located for anyone looking to spend time in the vibrant centre of Madrid. Located on Calle Arenal (or Arenal street) the location really cannot be better. Look out of the door to the right and you are just a few steps from the Puerta del Sol in the heart of old Madrid. Look down the street to the left and you see the columns of the Opera House. The Royal Palace, La Latina, Sol, the Shopping Centre, Malasaña and Plaza Santa Ana are all within easy walking reach. As you probably have already seen, Arenal as a street is animated with shops, cafes and bars and the occasional street act. It runs at the one end from Puerta del Sol to Opera, the Plaza de Oriente and the Royal Palace at the other. These are the Must-See items on the Madrid To Do list. Just a minute or two walking distance away and running parallel to Arenal, is the Calle Mayor, the street which borders the historical Plaza Mayor. At the end of the Plaza Mayor is the rustically elegant Mercado de San Miguel, an up-class market where you can wander from stall to stall mix & matching “tapas” of local delicacies, snippets of sea food, desserts and glasses of wine. Slightly on from there, again at a walking distance, is the La Latina district – an area of town known for its excellent restaurants and tapas bars open until all hours of the morning! The apartment is almost on Puerta del Sol. “Sol” (sun), as it is known, a plaza in the shape of a rising or setting sun, is at the heart of the Madrid de Las Austrias, the historical Madrid. It’s in easy walking reach of the Plaza Mayor, Mercado de San Miguel, Royal Palace, Cibeles Palace, and central also for visiting the Templo de Debod, the Retiro Park or the Art Museums (Prado, Reina Sofia, Thyssen). Main shopping streets of Arenal, Preciados, Gran Via and Fuencarral are a few steps away. For all attractions, it’s nearly impossible to have a better location! english, french, spanish, portuguese, Italiano "piu o meno"
Hey there, We're Luke & Family, a cross-continental multi-lingual mix of Brit and Uruguayan (+ cheeky bilingual 3-year old). I'm Luke - the straight-faced Brit part. I decided to hang up my UK origins, uproot and travel the world as a biz journalist nearly 20 years ago. 11 months of the year Travelling in 5-star hotels may sound nice, but 11 months of the year of you miss home the freedom that your own place brings - those home comforts. This is why Home Holiday Rental is such an awesome concept. Thanks for checking out our place and hope to talk to you soon! Really unbeatable location on the pedestrianised Arenal street that runs from "Sol" to Opera. This is comfortable, spacious and safe - really made to measure for all types, adults, seniors or children. Hence - 15 consecutive five star reviews across our Webs. o	3 Air Conditioning units installed for max. freshness to get out of the summer heat when required. o	Fibre Optic Internet + Google Chromecast to watch YouTube or your Chrome on the TV + HIgh Speed Internet o	Fixed line phone avaialble to use for local calls (don't run up your roaming charges!) o	Multi-device WiFi dongle to carry around with you for connectivity in the city. o	Memory foam mattresses and pillows for the best possible night's sleep o	Really impeccably clean o	Really unbeatable location, handful of metres from Puerta del Sol to the right, to the left are the columns of the Opera. o	Noiseless: double windows that give on to the street, so no noise penetrates. Thick walls. No neighbours on either side. o	Interior patio extending from the kitchen to grab tea or coffee o	Sleeps 7 - and you're in the centre! o	Interior design details: chromed lightswitches & plugs, ivory-themed, slated bathroom floor. First impressions were of owners Luke and Poala through communication. I am a person who needs to plan a little bit due to ages of children. Luke really gave me that luxury! Not to mention a flight that was insanely delayed, which meant all plans got crushed. It was *SO* wonderful to be greeted by a happy, smiling face in Poala after all of that debacle. And the communication throughout was perfect - not too much, not too little. We were set up perfectly in the location between Sol and Opera to access what we wanted to in the short 2 days we were there. Thank you, thank you, THANK YOU for making our first entrance to España so beautiful and easy. We are so appreciative of Luke, Poala, and their girls! Will recommend to anyone we know heading to Madrid. This apartment is literally in the center of Madrid. I knew nothing about Madrid before I booked this apartment and I was lucky to have found this wonderful apartment close to everything we wanted to see! Although the apartment is in a very busy part of town, the fact that the bedrooms have windows into a courtyard allowed us to sleep at night. The main living area was very spacious and we appreciated the comfortable sofas. Luke was very responsive to my many questions before our arrival and during our stay. I don't believe I could have chosen a better spot. Note to new timers in Madrid - there is more than one train station so if you are planning a day trip on your own, double check the station. Because we start early, we did make it to the correct one on time, but with minutes to spare. A very comfortable, well equipped, conveniently located property. Luke is available for any questions and very helpful. Everything was just what we needed for a perfect stay, right in the heart of old Madrid-- restaurants, sights, Metro, shopping, markets, taxis. Would certainly book again if we ever return to Madrid! From our first VRBO communication with Luke Allen, this was a very pleasurable experience. Everything worked in the apartment and we tried to eat in as much as possible, however with the many tapas restaurants within walking distance it was hard to prepare a meal that could be done for less than we could buy the food for. Our stay was from 28 October 2018 until 3 November 2018. The Prado Museum was with in walking distance as was the Palace. We used the hop on hop off to get a tour around Madrid and various tour private tour providers, all of them were excellent. A Beautiful apartment in the middle of all the action! We thoroughly enjoyed our stay. Luke was excellent at staying in touch and promptly meeting us on arrival. Plaza del Sol was literally steps away. My only complaint was that we did not spend more time there. Highly recommend! Enjoyed our recent stay at the apartment. Luke met us & went over all the details. You can’t beat this location!